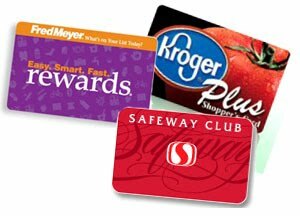 Stretching the One Income Dollar: Supermarket Loyalty Cards: Are They Worth it? Supermarket Loyalty Cards: Are They Worth it? Years ago, super markets hit upon a now classic idea: requiring customers to display a card in order to receive a special discount. In terms of advertising and branding, it was a success. The concept hits all the important consumer notes... it rewards the loyal customers with discounts above and beyond other shoppers, because card holders were likely to keep the card on them at all times either in their purse or wallet it acts as continual brand re-enforcement, and it's non-obtrusive nature allows non-cardholders to carry on their business. With technologies pioneered by the credit card industry, the cards took on new life. Customers could quietly accumulate points and additional earnings, stored in some unknown off-site location. In practice, it was similar to the punch cards that give you a free item after 10 purchases, but with the ease of a scan or a swipe, transaction times were reduced. Now, stores have many different uses for the customer loyalty cards. Some stores can allow customers to "pre-load" coupon savings into the cards and thus avoiding the pain of printing or clipping, while others use the cards to incentivize shopping in certain fields by, for example, giving customers additional bonuses for purchasing gift cards. What Can I Really Save? The savings will depend on the store. As stated previously, some stores use the cards to encourage repeat purchases of certain items. Getting one free holiday card after purchasing 10 is like getting a 10 percent discount. Others use the cards to trigger advertised sales, so that without a card, customers cannot take advantage of a buy one get one free sale. Some stores allow you to scan your card at special kiosks to receive additional coupons. Some stores have gone even farther with their programs. Take the Price Chopper franchise in the Northeast United States. Spending $50 at the store, and using your card, entitles you to a discount of 10 cents off each gallon of gas you purchase at participating gas stations. A family spending $150 a week in groceries can save $1.20 on each gallon of gas they purchase at the end of the month, or 30 cents each week. Periodically, additional savings are allowed with the purchase of certain combinations of items, or a certain amount of products by one manufacturer. Depending on the size of your gas tank, the savings vary, but would be roughly one and a half percent. When stacking of a promotion is allowed, the savings can be considerable. In the situation above, the purchase of gift cards counts toward gas discounts. Using your card to buy only store items that qualify for buy one get one free sales, and paid for with a previously purchased store gift card, will result in significant savings. In addition to the fifty percent savings with a "BOGO" sale, you received a 1.5% savings through the gas purchase incentive program, added to the 1.5% savings from purchasing the card that paid for the present transaction. The most notable downside is consumer privacy. The cards often require consumer information, such as address and name, and tally up information about purchase trends, interests and other potentially sensitive consumer data. The thought of having a third party harvesting and collecting information about the frequency and types of purchases you make can be unsettling. By following the frequency and types of diapers a parent purchases, this third party can track your child's age and tailor advertisements specifically to your demographic. As you can see, there are a number of benefits to having a supermarket loyalty card, however the trade off some benefits is supplying retailers with demographic data and other somewhat private information. Miles Walker is a freelance writer and blogger who usually looks at car insurance quotes over at CarinsuranceComparison.Org. His most recent review looked at the best Alabama car insurance.